Not your everyday bathroom graffiti! Maybe a sign? So great how you create a weave between your words and the photo. I’ve never seen anything like that! I love it. 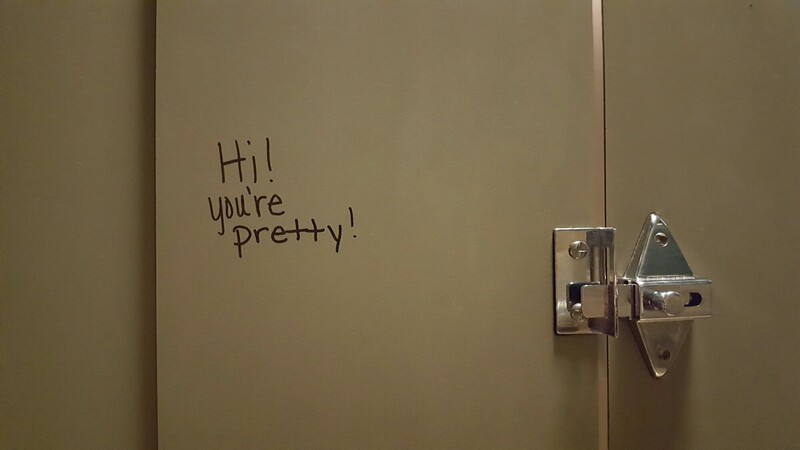 I sort of want to start defacing stalls all over the place with the same sort of stuff! I won’t but it really makes you think about what you typically try not to read in a stall. I’m with you – leave it! Great slice! This was in as public a restroom as they come. And easy entirely too perfect! ….and I think my reply has autocorrect typos! Sorry!!! That is fun! Someone is out there spreading subversive sunshine…and I’m sure it’s given many people a smile! Especially with the neat way you shared it here!